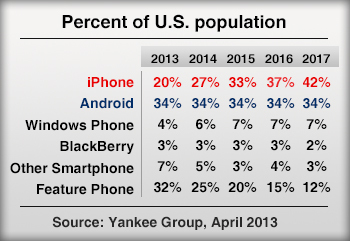 In a recent report, the Yankee Group released the results of a survey that shows that the iPhone will surpass Android in number of users worldwide by 2015. The iPhone has significant consumer loyalty with a reported 91% of respondents saying that they plan to purchase another iPhone when they next purchase a smartphone. Alternately, only 76% of Android users said that they would purchase an Android with their next smartphone purchase. The Yankee Group has predicted that the Android market share has peaked at 34% and that the iPhone will continue to rise steadily and eclipse Android market share by 2015. As you can see from the graph, iPhone and Android may be the two major forces in the smartphone market place, but together they still only make up just over half of the market share worldwide. When developing your website and considering your mobile options, it's wise to not just develop (or test) for just one device. We've been talking a lot about responsive design and with the proliferation of not only many types of smartphones, but also tablets in varying sizes, responsive design is rapidly becoming the option for mobile to enable you to deliver content consistently to your users - no matter how they reach you. 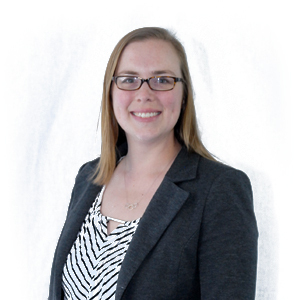 Jen Herson has honed her talents and skills as an effective communicator throughout her career, including time spent as a writer and editor of children's books where she learned to distill difficult subjects to 200 words or less, a marketing army of one responsible for all aspects of every campaign and event, as well as a highly contributing member of a productive marketing team.